Dallas Cowboys receiver Miles Austin prior to the game against the Green Bay Packers at AT&T Stadium. 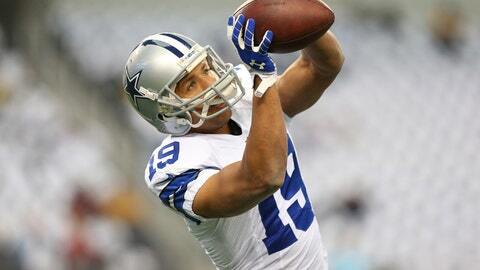 For the first time since his rookie year in 2007, Dallas Cowboys wide receiver Miles Austin finished a season without a touchdown catch. In 11 games, Austin totaled 24 receptions for 244 yards, both are his lowest totals over the last five years. Before exiting the locker room after Sunday night’s 24-22 season-ending loss to Philadelphia, Austin was asked if he was stunned by his poor stats. "It’s a physical game," Austin responded. "Things happen. I think other guys were playing great. Dez [Bryant] obviously had an amazing year. Terrance [Williams] did great. Jason [Witten’s] always been doing good. "It’s all about how you fit into the offense and how things work. You put your heart on the line every single day. It’s tough for it to end like this." Austin, 29, is under contract for three more years, however, his lack of production and injury history could force the Cowboys to part ways with the former Pro Bowler. Asked if he thought he played his last game with the Cowboys, Austin said: "I’m just taking it one game at a time." Has he talked to his agent about his future in Dallas? "I just lost a heartbreaking game," Austin said. "This is where I’m at."